Here is a list of recipes with homemade chorizo ​​, ideal for any time but especially when the weather is cold and you need extra calories. It is important to clarify that all these recipes of chorizo ​​ are full of calories, and that is precisely their mission: a powerful and delicious recharge of energy for your body. Welcome to the world of stews and meals forceful whose main ingredient is chorizo! Potatoes a la Rioja: a good way to eat chorizo ​​is with potatoes and peppers. Besides being a very easy recipe to prepare, it has a powerful dose of calories, which makes it ideal for cold weather. Cocido Madrileño: and speaking of strong foods, nothing beats the king of the boiled . It is prepared with chickpeas, cabbage, carrots, potatoes, veal, chicken and pork. And of course, chorizo. Asturian fabada: if in Madrid there is a stew, in Asturias the fabada. Stunning traditional food of the whole region with two main ingredients: fabes and Asturian chorizo. Galician stock: in Galicia do not stay with arms crossed watching how locals and Asturians prepare separate stews. The Galician soup is a delight. It is prepared with ingredients from the region, including the Galician chorizo. Lentils with chorizo: one of those typical dishes of our grandmothers. Delicious, nutritional and easy to prepare. 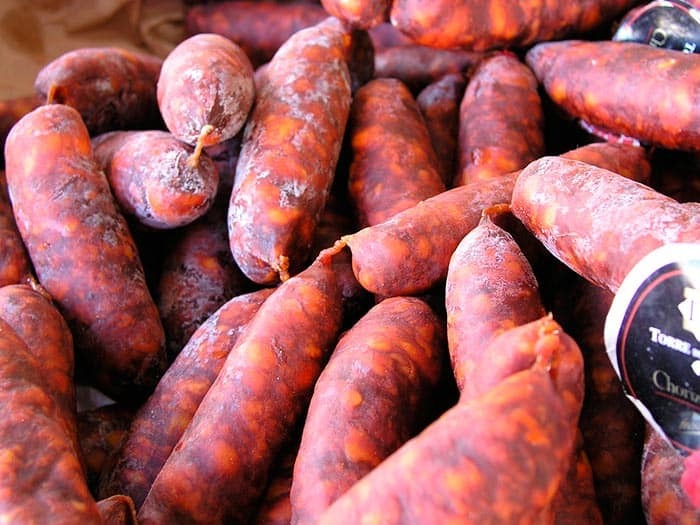 You can use almost any type of chorizo ​​for cooking. Chickpeas with chorizo: another simple recipe with chorizo, similar to lentils but with chickpeas. Potaje de beans pints with chorizo: Pinto beans are, for many, the best legume to savor. Get a good chorizo ​​and you will have a recipe of 10. White beans with chorizo: it seems that the chorizo ​​and the vegetables are inseparable. And well, maybe yes. The white beans are very nice on the plate painted by the delicious fat that leaves chorizo ​​in the broth. Pot rotten: the name may inspire you fear, but you do not have to: it is a cooked from the Spanish gastronomy of past eras. It is made with different parts of the pork, and of course, chorizo. Potatoes revolconas: although this dish is usually prepared with torreznos, you can also use chorizo. Simply substitute one ingredient for the other, or better yet, use both! Migas: a dish whose raw material is bread, specifically bread crumbs (hence its name), which are fried in oil and they put chorizo ​​and pepper on them. Simple but effective. Broken eggs: for me this is one of the best foods that exist. It has everything we want in our body: chips, fried eggs and chorizo. healthy? Bueeeee ... amazing! Portuguese green broth: one of the most famous dishes of Portugal, is prepared with mashed potatoes, cabbage (also known as Galician cabbage) and Portuguese chorizo. Tortilla with chorizo: the traditional tortilla of potatoes can be made with some pieces of the delicious meat sausage. Let's not doubt, the recipes with chorizo ​​are wonderful, always. It is a magical ingredient that makes everything you eat delicious. You can prepare from a simple bread stuffed with chorizo ​​to one of the traditional cooked Spanish cuisine mentioned in this post, the flavor will always be strong and you'll want to repeat. Just do not forget that chorizo ​​is a high-calorie sausage.